One thing that is true about all of us is that, we all face disappointments. In every area of our lives, whether it be in our relationships, marriage, business, ministry, work place, life situation, etc. there is always disappointments that we have to overcome. Maybe you’re going through something at the moment. If so, my hope for you is that you allow these Scriptures to speak life into your current situation. To be disappointed is to be discouraged or sad because of an unmet expectation regarding someone or something. Disappointment can lead to despair. Be very careful when you get discouraged and disappointed. This is a pivotal moment in regard to how you walk with the Lord in this specific season of your life. You can either dwell on the negative, which will cause you to stumble because your disappointment can easily zap the spiritual strength out of you, or you can focus on Christ. Keeping your mind on the Lord and the love of God will help your feet from stumbling. By doing so, you live in the light of eternity and you learn to trust in God’s will. What’s your response going to be? The next move you make after disappointment is crucial to your spiritual health. 1. Proverbs 3:5-8 Trust in the LORD with all your heart and lean not on your own understanding; in all your ways submit to him, and he will make your paths straight. Do not be wise in your own eyes; fear the LORD and shun evil. This will bring health to your body and nourishment to your bones. 2. Isaiah 40:31 But those who wait on the Lord Shall renew their strength; They shall mount up with wings like eagles, They shall run and not be weary, They shall walk and not faint. What do you do when you get disappointed? Let me ask you again, what is your response to disappointment? Is it to revert back to old ways or is it to worship? Let me give you an example. Let’s say you have been fasting and walking in obedience for God to answer a specific prayer, but God didn’t answer that prayer. Due to God not meeting your expectations you stop walking in obedience. Does this show someone who is serious? This shows someone who wanted to put on an act for God to answer. What was Job’s immediate reaction to his trials and tribulations? He worshipped! This is so powerful. Here is a man who suffered dearly, but instead of being bitter towards the Lord, he worshipped. This should be our response. When David was fasting for his son, did he turn away from the Lord after finding out his son died? No, David worshipped! By worshipping you’re putting your trust in the Lord. You’re saying, I might not know why this happened, but I know that You are good. God already knows how you feel. Don’t try to hide your emotions, but instead bring them to Him. I know first-hand that disappointment is painful. Disappointments in my life has led to many tears. It’s either your disappointment is going to drive you away from God or it is going to drive you to God. God understands how you feel. 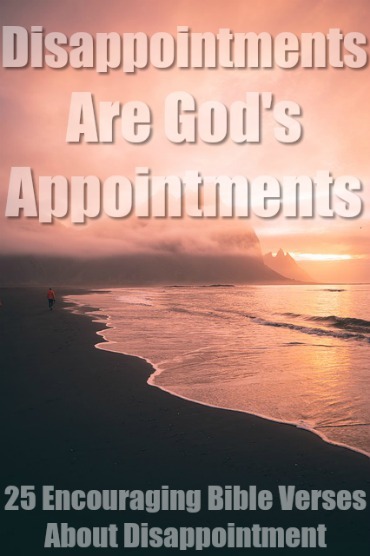 Talk to Him about your questions. Talk to Him about your doubts. Talk to Him about your confusion. He knows that you are struggling with these things and more. Be open and allow Him to encourage you, comfort you, guide you, and remind you of His sovereignty. Why do I mean by this? Every trial that we go through in this life is an opportunity to grow. Every tear and unmet expectation in this life is an opportunity to look to Christ. If we’re not careful we can easily have the mindset of, “nothing never goes my way God doesn’t love me.” Have we forgotten that God’s great goal is to conform us into the image of His Son? Your disappointment is doing something in you. You might not be able to see what your disappointment is doing, but who cares if you can’t see at the moment. You’re not asked to see, instead you’re told to trust in the Lord. Use your trial to see Christ in a way that you’ve never seen Him before. Allow God to use it to work in you and to guide you in the right direction. We have such minuscule plans for ourselves compared to God’s plans. 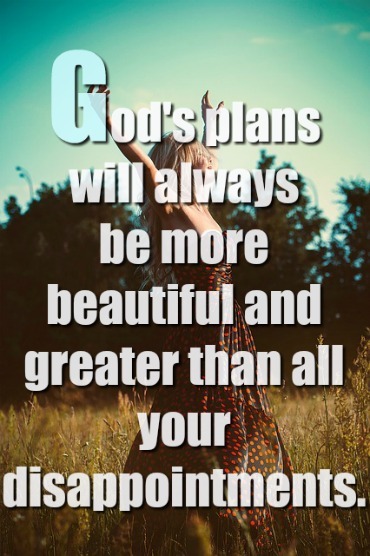 God’s plan is better. This might sound cliché because we turned it into a cliché phrase, but this is the truth. When we are aligned towards the will of God we learn to appreciate God’s plan. I look back at my past disappointments and now I see how pitiful my plans were compared to what God wanted to do in me and around me. Let go of trying to control the situation. Wait on the Lord and while you are waiting pour your heart out to Him daily. Learn to rest in Him and align your heart to His will. Be willing to listen to the voice of God. Don’t try to drown out His voice to pursue your own will. Sometimes disappointments happen because we fail to trust in His timing. Just because God doesn’t do something today doesn’t mean that He is not going to do it tomorrow. Always remember this, God sees what you can’t see and He knows what you don’t know. Trusting in His timing is crucial. His timing is always right on time!